This week we had two exciting events. 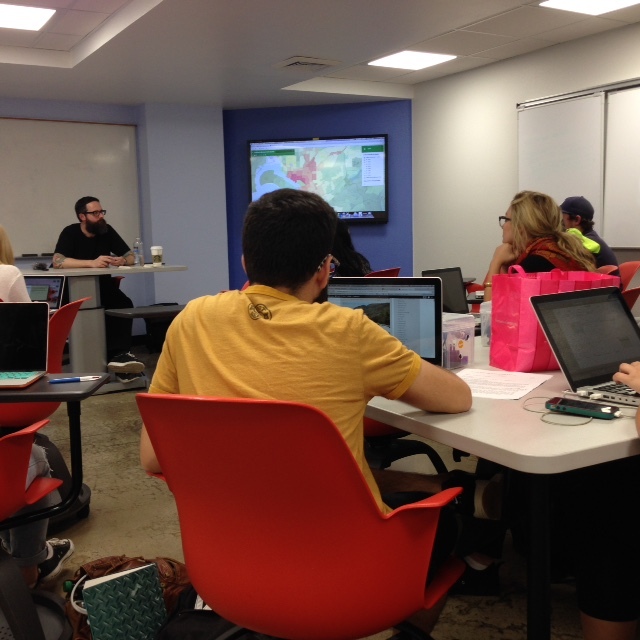 Sean Bonner of Safecast visited our class on Monday and we launched our news section on inewsource on Wednesday! Sean Bonner showing a map of their sensor deployments around the world. Bonner visited our class on Monday and spoke with us about the launch of Safecast four years ago this week. They now have 600 of their radiation sensors deployed throughout the world and over 30 million data points. Anyone can go to the Safecast website and view their numerous maps showing the deployments of the radiation sensors. In addition, anyone can visit their site and download all the data collected from the sensors. They have made the data available in a simple CSV format via CC0 license. Bonner’s open-data, open-source perspective for the public good was a refreshing perspective to hear. We also had time for Q&A with Bonner to get his ideas and advice about our air quality sensor and the overall project. One key point Bonner mentioned that stuck with me and the students after his visit is that sensor journalism is here to stay. The form and way that it comes to be remains to be seen, but journalists and journalism students should be cognizant of this new form of journalism that can open up the path to new storytelling in communities around the world. At the same time, with this new door of opportunity comes many challenges as well. Bonner also stated that we are on the cusp of seeing how electronic open-source sensors will become more accurate in how they capture data. For our sensor project, we are currently discussing the calibration aspects of our air quality sensors and the role of accurate data when using electronic open-source sensors. Time will tell as more people get involved in the sensor/ sensor journalism movement in the years to come, and we see how these aspects will play out. It’s a crucial one for journalism in which accuracy and truth are at the core of its mission. 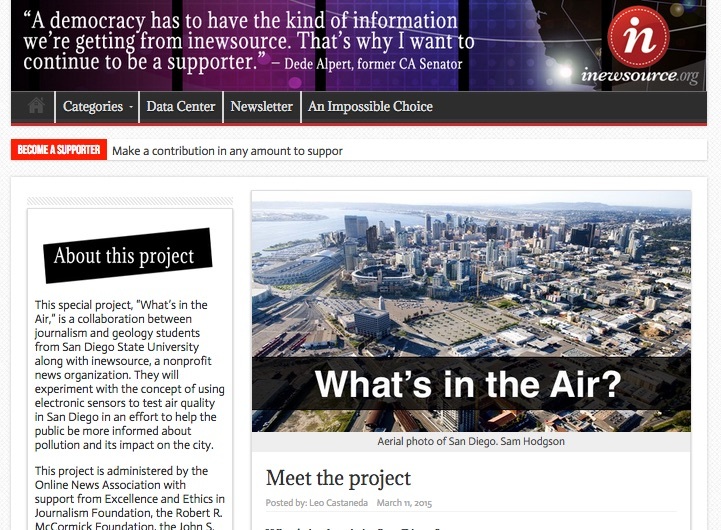 On Wednesday, inewsource launched our collaborative news section on their site, “What’s in the Air.” Each of the students in the class wrote one factoid about air quality that is featured in the “Meet the Students” section. In the weeks ahead we will have more news coverage to come as the students hit the streets to report on air quality in San Diego. On the community front, we have several community members who have received their sensor prototypes and are beginning to deploy them in their neighborhoods. We are happy to have their involvement and continual feedback as we work to refine the data collection process from the sensors. Next week, we will be jumping into more work with GIS and data journalism techniques. Stay tuned!